Wow, time to catch up again…I’m behind by three days! Since it’s been so long, I’ll try to condense the activities so that this post doesn’t become a book. Thursday was “country walk” day. This is when there are no sidewalks or curbs to go by, only roads. The technique would be most useful on rural routes (hence country walk), but is also useful in parks, on subway platforms, and really anywhere else you’d trail the side of a path. So, for a country walk, you follow the left side of the road, facing oncoming traffic. Every so often you’ll have the dog stop, and then you turn left and have it find the edge of the road. Once you’ve found the edge, you continue walking. This is to ensure you remain on the left side of the road, as the dog/you can drift towards the center of the road at times. Another interesting thing about country travel is crossing intersecting roads. When you come to an intersection, you walk about 15 paces in, check the edge, then about face, and if no traffic, cross the road and continue traveling. This is good for safety and orientation. Another awesome thing I learned Thursday is how to landmark. Utilizing rewards, you target an item, such as a mailbox or post, or even an indistinguishable place in the road. You give the dog a reward several times at the spot, and then back up, have the dog find it, and when it does, make a big fuss, tap the object and reward. The dog will then associate good things with the landmarked item and stop there to show you it. So cool! Oh, and one more thing about Thursday…Jingles and I were practicing heeling with her little shoes on, so that she’s comfortable with them for when she needs to use them. We were walking up and down the hallway near my room, and Jingles was doing the funniest thing. When we’d walk up the hall, she’d heel perfectly, but when we’d turn to go the other direction (which faces an outside door), she’d only army crawl. The moment I turned and we walked back the other way, she’d be fine again. Turn again, and it was the army crawl. Haha, funny puppy. We’ll have to try that again before I leave. Friday was insanely busy, which is why I’m so behind in my writing. First, we went off to a nearby small town to practice walking on crappy sidewalks. Jingles and I did pretty well, minus a few hang ups here and there. After the small town walk, it was back to the school to get ready for class pictures. Class pictures were quite the feat! Imagine trying to position 11 spunky dogs and their newbie owners in an organized fashion. But, the instructors with their magic touch were able to get all people and canines cooperating for a great photo 😀 We also got individual photos with our dogs taken, and many of us requested special photos of our dogs alone, so a picture of Jingles will soon be hanging in our house. After class photos were vet visits. Each of us guessed our dog’s own weight before it was put on the scale. I was torn between 53 and 54 lbs. for Jingles’ weight, but guessed 54…and she weighs 53! Wow…can’t believe how close I came. Also, her birthday is Oct. 11, and she will be 2 next month. I thought she’d be a December baby with the name, but she’s an autumn girl  I also found out who her dog parents are. After the physical, I am happy to say that Jingles is in tiptop shape! After the physicals was a lecture about vet care and the dogs’ health needs. It was incredibly interesting and full of valuable information. This brought us to dinner. Afterwards, we waited for a bit, and then it was back to the small town for a night time walk. The walk was awesome! It was so great being able to comfortably walk in the pitch black, knowing my dog would alert me to curbs and follow along the sidewalk. Amazing  That wrapped up Friday. Today, we were back in White Plains. It was ridiculously hot outside, but we all still managed to get two routes in. One of the things we focused on was the “traffic check.” This is where the dog has to stop for a car, should it cut in front of you. This is done in a controlled fashion, with one of the instructors driving in front of you without warning. Jingles stopped immediately. How amazing that she should protect me from being hit by a vehicle! While I was on one of my routes, it finally dawned on me…I had just avoided people, cars, poles, and followed the transition from wide to narrow sidewalks seamlessly while walking my normal, quick pace, thanks to Jingles. I can’t even believe it. With bob (stick), that block would’ve been torturous, but with Jingles, it was a breeze. I am in awe. The past couple of days have been awesome! I wanted to write yesterday, but was just not up to it. Unfortunately, when I don’t recount the day’s activities at its close, the days run together and I’m not sure which day held what. So, I apologize in advance if I accidentally repeat something; chances are I just thought it happened that day. So yesterday, after our morning route, which was…okay (we still have a lot to work on), we all loaded into the vans and drove to a nearby mall, which I believe is JB mall (I may have gotten the name wrong). One by one we worked the dogs to the doors, through the doors, and to a table near a Starbucks kiosk. It’s a blast working the dog, especially when she brings me exactly to the object I want to go to. The purpose of this trip was to learn to ride escalators and get some experience walking in indoor shopping areas. One of the assistants told me that it was priceless to watch people riding the escalators, minding their business, only to look down and see a pack of dogs lying under the tables below. Hilarious. When it was my turn, I listened to the instructions of what to do, and after being lined up with the escalator by my instructor, told Jingles to go to the stairs. She immediately came to the escalator, and I practiced the moves I was taught about riding. 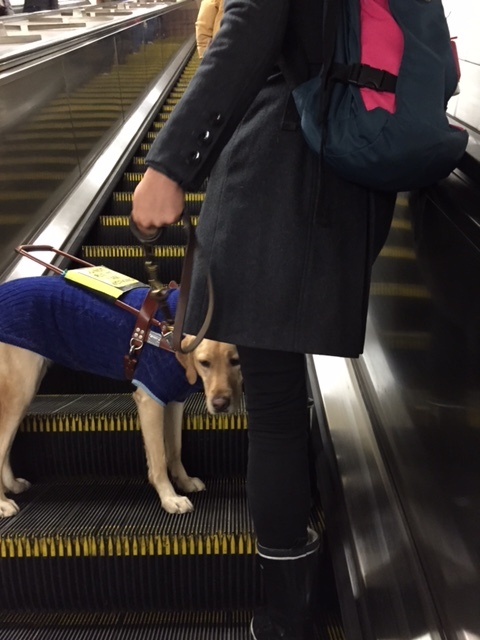 You have to check the hand rail and make sure the escalator is going the right way, count to three, and give your dog the command to come with you, while you are not holding the harness handle (basically this command is for the dog, not the guide work dog). The dog steps on, and you tell her to stay, stretch your arm way out so you can feel the escalator changing its slope near the top or bottom, and when you feel this, begin walking and tell the dog to come with you. After you’re off the escalator, the harness handle is picked up, and you’re on your way. Jingles did great, and I think I did alright too. After the escalator, we practiced walking in the mall, which is interesting, because in indoor spaces I am constantly having to tell her to slow down so we don’t run shoppers down, haha. She did fairly well, except for trying to eat a pretzel off the floor and trying to visit with one couple. From there, we practiced going up and down regular stars. After arriving back at campus, the van dropped us at a different entrance. Obstacles were set up by the instructors, and we worked our dogs from the van to our rooms. Jingles did wonderfully, although I had to slow her since we were indoors, but it took all of 20 seconds to go down both hallways to my door. So fun! In the evening, my classmates and I attended an introductory yoga class. The yoga instructor showed us a few breathing techniques and stretches to loosen up our bodies. It was pretty neat to learn the stretches, though I can’t remember half of them. Today was wonderful. It wasn’t quite as warm as the past few days, which made the routes more enjoyable for everyone. The first route Jingles and I went on was an extended route to what we usually do inn White Plains. Things went pretty well. Jingles got distracted a couple of times, but after having a quick training session with an instructor the night before (forgot to mention this) in how to handle the situation, I did better and we had a great walk. Our afternoon route was super fun. First we walked a different way than usual, and then made our way to Macy’s, where I walked with Jingles through various departments, including the china section. We rode down an escalator too and eventually found our way out. She did great 😀 After Macy’s, we walked through a crowded area with benches and fountains. Jingles rocked it, only getting distracted once. Looks like she’ll be great in crowds! What a fun adventure. This evening I spent some time hanging with my classmates. It’s amazing the comradery that has developed. Even though our ages span generations, we’re all on the same playing field and have tons of experiences to share with each other. I’m really going to miss these folks. One of the girls could see well enough to do nails, and began painting some of our nails for pictures, which will take place on Friday. We sat and laughed and had a ball. Then, later I practiced some heeling with Jingles around the building, and here I am. Well, folks today has been super busy, but I am extremely exhausted, so I’ll condense this post as much as possible, and sorry for the abbreviated description of the day. It was hard to sleep last night, probably because of having a dog in my room for the first time combined with anticipation for the upcoming day. After getting a shower, my dog and I went out for the 6:00 am “park” (bathroom) time. Can’t remember if my dog did anything. After the park time, I fed and watered her, and it was back outside for another ppark. Once the bathroom break was over, it was off to alumni hall for obedience, with an actual dog for the first time. After obedience was breakfast at 7:00, back to the room to put the working harness on my dog, grab a few things, and we loaded into the van to head to White Plains. We each took two walks with our dogs, one in the morning, one in the afternoon. I was last in line before lunch, so I sat on the balcony for a while. Then it was back downstairs for another bathroom break for the dog, and out we went. The walk was great, surreal almost. My creature led me around strollers, people with umbrellas, outdoor seating areas, through narrow sidewalks, and to each and every curb. We crossed streets with ease, the pup (ahhh it’s so hard not to say her name) slowing when necessary to avoid turning cars. It is a truly incredible experience. The only downside to today’s walk was that it was a good 90 degrees out, and the poor dog was hot. Poor dog, I should be saying poor instructors. The each had to have walked 10 miles over the course of the day’s training. Lunch was grilled cheese and tomato soup. Delicious. All of our dogs were so much better behaved at the meal than yesterday. After lunch, the walks began again. I was the last one out before we departed. Once again, my sweetie was wonderful. She walked like a trooper, even though it was so hot and she was tired. Afterwards, we headed back to campus for a quick rest, and then it was out to park again. Dinner was amazing. I had baked tilapia and string beans…mmmm. Again, the dogs were much better behaved than yesterday, lying beside the chairs nearly the whole time without getting up. After dinner, a couple of friends and I decided to explore the upstairs areas of the buildings with our dogs. That was a doozy! None of us could get our dogs to heel. They kept surging towards offices and areas they knew well. All training was lost at that point haha, but not completely. So, we quickly went back downstairs, and then it was time for the evening lecture. The lecture covered tons of material. Tons. I have no clue how I am going to remember it all. Once the lecture was over, we watered and parked the dogs, and then I learned how to groom my friend. It was really easy, simply stroking the back and sides with a comb, followed by a brush. After the grooming, I loved on my pal for a few minutes, and then I got to test leaving her alone in the room while I left for about 10 minutes. This was a bit of a relief for me, it’s been a journey the past couple days. I’m sure it was nice for the dog too. She must be so stressed with this human who doesn’t know what she’s doing handling her at all times. She did great, no whining, and actually I don’t think she really wanted to hang out when I came back, ha. After a final bathroom break, it was time for bed. And here I am now. I apologize for the rundowns of my day being a bunch of “and then”s! I’m too tired to embellish right now though. You’ll have to bear with me over the next several posts. I am exhausted, overwhelmed, and mentally drained. I am loving learning so much, but right now, I don’t know how I’m ever going to remember it all. Tomorrow is a new day. I know I’ll get the hang of it, it just takes time. Hopefully I get it over the next 2.5 weeks!